A defined jaw line or strong chin can help to frame a face. Having a ‘weak’ chin can actually affect the balance of your facial feature and be detrimental to your confidence – especially if you’re male. A strong jawline is often associated with masculinity, so for male patients, chin implants can be used to reshape the lower face. For patients that would prefer their chin to be altered in terms of size or shape, chin implants are an effective solution, creating facial features that are better proportioned and more balanced. Chin implants and chin augmentation can be combined with other facial surgeries, such as a facelift or rhinoplasty surgery to achieve better overall facial balance. • This form of surgery requires careful planning in order to ensure facial harmony. • An incision is created either inside the bottom of the mouth just in front of your bottom row of teeth, or just under the chin. • The former option is preferred for most surgeons as it leaves the patient with no visible scar. • Once the incision has been made, a ‘pocket’ will be created just in front of the jaw bone in order to place the implant. • The lower face will appear reshaped but may require adjustments. • Chin implants are usually made of hardened silicone or a material called medpore. 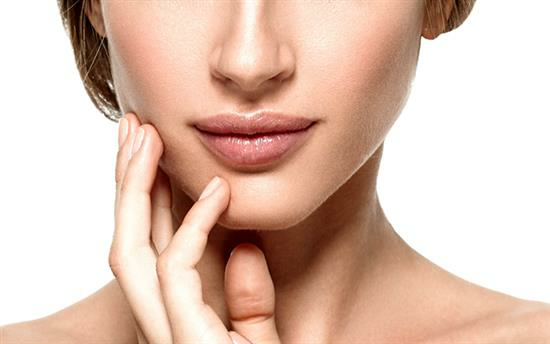 Chin augmentation with an implant is a fairly simple surgical procedure with minimal risks. However, like any cosmetic procedure, there are complications and risks involved that should be considered before undergoing this procedure. The main risk involved with chin augmentation is an infection but this is rare and patients will be given antibiotics. General anaesthesia will also be used during this surgery and carries risks that should also be considered. Your surgeon will discuss in more detail the possible risks during your consultation. Mild pain relief is prescribed and given to patients during the recovery process. There is minimal swelling and bruising involved with chin implants, and if the incision was made through the mouth the stitches used are dissolvable. Recovery time for chin augmentation varies from a patient to patient basis. Surgery takes around one hour and you’ll likely need one to two days off work to recover. Full recovery takes around two weeks although patients will start to see the best results six weeks after surgery. When undergoing chin augmentation with implants, it’s important you choose a surgeon that is highly experienced in delivering this form of facial cosmetic surgery. Dr Chana is a plastic surgeon who specialises in facial cosmetic and reconstructive surgery. He is a master of minimising scars left after surgery and is well known for individualising procedures based on the patients’ facial characteristics. Dr Chana is a well-known and respected member of both the cosmetic and plastic surgery industry; he is well published within the cosmetic sector and has also made several appearances in the media including BBC, Channel 5 and Sky as well both newspapers and magazines. Gaining a stronger chin or jawline can change the structure of your face and even change the appearance of existing facial features. If you would like more information on chin implants or any other cosmetic procedure, book your consultation with Dr Jag Chana today.